I received a request last week from a runner friend of mine Nicholas to write a post about “racing hills”, as he made a comment about how he couldn’t remember anyone racing hills as strong as I had been lately. It made me stop to think about the last 8 months, ever since the scene of my biggest running disappointment to date, the 2010 Boston Marathon. Like many runners, “running Boston” became my primary focus as I began training seriously for the Pittsburgh Marathon in 2009. In hindsight what I was really training for was not so much “running Boston” as I was “qualifying for Boston”. Over the course of 2009 my workouts were built around endurance and stamina. I knew that I needed to run more miles and be able to run them at a pace somewhere around 7:35 min./mile pace to make my qualifying time of 3:20:59 at Pittsburgh. My training for Pittsburgh in 2009 did not include any speed work and very little in the way of true hill work. It was all about running more and more mileage so that my pace would hold up over the 26.2 mile Pittsburgh course. Mission accomplished as I ran a great race in May of 2009, finishing with my Marathon PR of 3:17:43 and my first of what I hope will be many Boston times. As I began training for Boston in 2010 I thought that my previous training plan would suffice. I would mix in a few more hills along the way, but again, no real focus on speed or hill repeats – just more of the same. Never had those words been truer than my inaugural journey at the Boston Marathon. I could make excuses all day long about my shin splint issues that delayed my Boston training last year. I could cite the fact that I could not truly “train” as I had in the past as I was forced to reduce my running to just 4 days a week preparing for Boston, rather than my usual 5 days as I was trying to be very careful to avoid reinjury. I could talk about the fact that with another marathon for Dom just 13 days later, I wanted to be a bit more conservative at Boston. Or even the fact that I only ran two 20-mile training runs instead of the four that I will run this year preparing for Austin. Some of those excuses might even have some shred of legitimacy. But if nothing else here at Run for Dom, we tell it the way it is. The good, the bad and the ugly. I was woefully unprepared for Boston in 2010. I was not a tough enough runner to survive the hills from Hopkinton to Boston let alone “thrive” on them. I needed to reinvent myself as a marathoner if I was to get back to Boston and run a different race the next time. After Pittsburgh I sat down and sketched out what I believed would make me a better runner over the summer months. How I would get faster, stronger and especially tougher. Speed work and Hill Repeats were going to be the two workouts that I was going to not only embrace, but make as the two cornerstones of my training plan. I was going to become a “hill runner”. I was going to become the type of runner that when others slowed at the base of a hill and prepared to get beaten up, I would look at the hill as an opportunity to gain on my competitors. While others looked forward to the “downs”, I would be looking for the “ups”. I wanted to run them and especially race them with purpose, determination and focus. I might not be able to get too much faster at 43 years old, but I knew that I could become a more strategic runner, a more focused runner, a runner with better form and especially a runner who could “out-heart” other runners of similar abilities. The training aspect has been covered in previous posts about Tempo Runs and Hill Repeats (click the links to reference previous posts). But as far as the question I received from Nicholas, what tips do I have about “racing the hills” – here goes. For me, and I have to stress that as an honest disclaimer, as all of us are very, very different in our running technique, strengths and weaknesses, there are four areas that I feel have helped me begin to thrive on hilly race courses over the past year. Having the confidence to attack an individual hill or a hilly race was at first born from my hill repeat training and then further underscored by success on race day. Running hill repeats every Thursday morning this summer and tracking my results workout by workout provided me with a great deal of confidence. 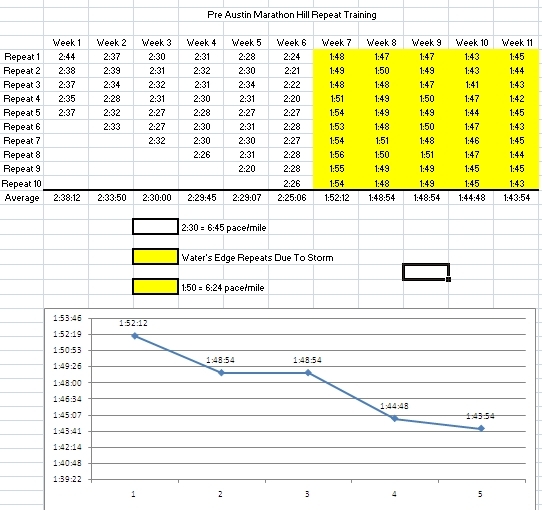 I prepared a spreadsheet each week and tracked each individual hill repeat week after week after week. After 10 weeks, I could look back on any individual repeat from my workouts to see just how much faster on the hills I was getting. Repeats that were taking me 1:48 seconds a month earlier were now taking me just 1:41. My repeats were becoming more consistent, with smaller variances between repeat number 1 and repeat number 10. I was improving, and the numbers backed it up. But interestingly it was during the third Summer Sunstroke 5K race that I participated in July when I realized just how much stronger I had gotten on the hills. 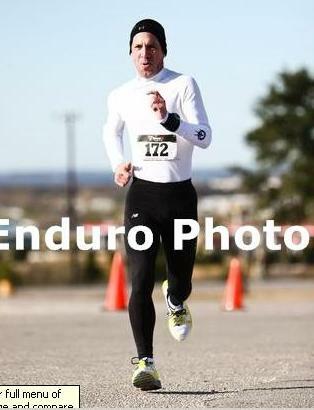 During the first two 5K’s over the same course as part of the series I finished behind a runner friend of mine Bill S. I had no answer for Bill over the closing mile of the race as the course ran straight up to the top of the dam at Brushy Creek Trail. Each time Bill would pull away from me and finish :15-:20 seconds ahead of me taking 1st place in the Male Masters Division. The third time was the charm for me however as after close to two months of hill repeats, I felt like I could make my move on Bill over the final mile. 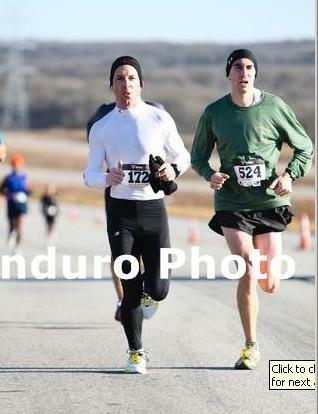 Just like the first two races, I was about :15 seconds behind Bill as we made the turn at the half-way point. I took a sip of water at the turn and pushed a bit harder closing to within :10 seconds as we reached the bottom of the hill. It was time to go. I was either going to pass Bill on the hill and pull away for a win, or I was going to blow up trying. Either way I was going to find something out about myself and my training. I pulled even with Bill at the ½ way point of the hill and gave him a quick nod. As I pulled alongside I pushed even harder and harder. I focused on my form, landing on the ball of my foot and pushing hard off of my toes. Much like I would do if I were racing on flat ground at the end of a 5K race. At the top of the dam I glanced quickly over my shoulder and Bill was close to :15 seconds behind me. Now on flat ground I was able to put the hammer down over the final .50 miles of the race, while Bill was still working to get to the top. I built such a large lead that Bill never bothered to try to chase me down. That race was the first time that I realized that even though Bill was a “faster runner” than I was, the advantage that I had on the hills was a great equalizer. It was in fact a weapon. Not only is the confidence that comes from running hills as part of your training a key element to racing hills fast under race conditions – but it provides a great sense of confidence over other portions of the course. You know as a runner that while other runners will be slowing, you will be gaining. They will be getting “weaker” while you are able to hold steady or perhaps grow stronger. It relaxes you, which in turn slows your heart rate and allows you to run efficiently. It is all connected. Confidence on race day is a powerful, powerful thing. Developing form or improving your running technique while you are racing hills is something again where practice makes perfect. During my hill repeats each Thursday I make a conscious effort to really focus on my running form during each and every 1:45 journey to the top of the hill. I work on landing on the mid-foot/ball of my foot on each stride and feeling my toes as the last part of my foot to leave the road on every stride. I focus on driving my arm swing straight forward and up, not wasting any energy swinging my arms away from my body or side to side. I make sure that I keep my shoulders relaxed and “away from my ears”. I practice keeping my hands loose and not clinched tight. On race day, these behaviors are all “automatic”. I don’t have to really think about it, relying on muscle memory from repeat after repeat, climb after climb. 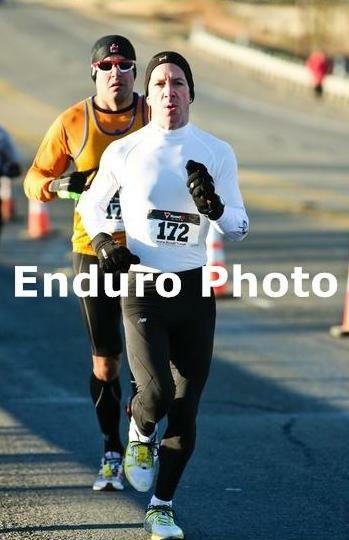 One of the things I noticed as I was racing at Decker on December 12th was that as I was pacing with another half-marathoner up the large hills at mile 8 and 10, the runner to my left would bump into me every dozen strides or so. I had picked a solid straight line to run that bordered the shoulder of the road to run the hill as tangentially as possible, hoping to cut the shortest route to the top. My running partner however was losing form on the hill as his legs started to waver to hold pace forcing him to bob left and right with each stride. Looking back at the still photos from the race below – you can see the difference in body control and effort while climbing. Conditioning plays a role in racing hills, there is no doubt about that. But technique and running form plays a large role as well. A final tip when racing hills is to fight the urge to back off of your effort when you reach the top. It is important to push through the end of the hill and keep your leg turnover or running cadence at the same effort. This allows you to fall back onto your race pace in as few strides as possible. Allowing yourself to become distracted and “celebrate” reaching the top of a hill will cost you valuable seconds at the apex of the climb. If slowing at the top of the hill only costs you :05 seconds, at a race like Decker with 12 climbs, you are sacrificing one full minute off of your race time just by easing off of the gas for a dozen strides at the top of each hill. In a sport where PR’s and Qualifying times are narrowly missed as often as they are achieved, these are valuable seconds to “give away” by allowing your mind and your pace to wander. 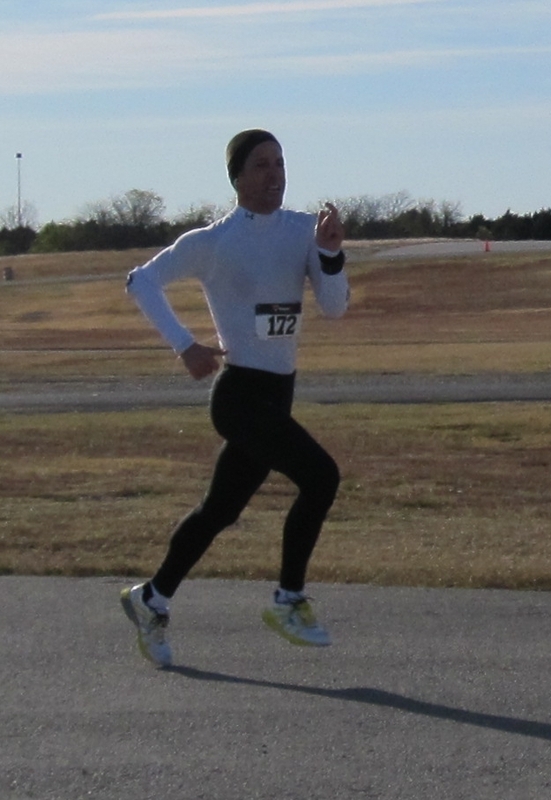 I have been practicing “kicking hard” for 20 strides at the top of each hill while racing, 10 strides per leg. This allows me to fall back into my race pace and not give any time back to the clock. One of the byproducts from hill repeat training is increased strength in your quadriceps and your calves. In a sense running hill repeats is akin to resistance training. You are able to train at the same speed you would on flat terrain, but increase the “difficulty level” by adding the elevation changes. This allows the workout to become much “harder” without increasing the intensity or the pounding that your legs are taking. You can push hard without increasing your injury risk, and managing your weekly mileage. The byproduct of this added strength shows up on each hill that you attack on the race course. It helps you realize that it is o.k. to push hard up the hill, as you will have more than enough strength to reach the top, recover and push forward back at your target or goal pace. This strength really comes to the fore when you find yourself passing runners late in a race. You are under stress just like everyone else, and your body is struggling to hold your pace just like your competitors, but I have found during the later stages of the hillier races I have run like The Run for the Water or The Decker Challenge, that I was the runner “passing” over the final miles, not being passed. The final piece to the puzzle for me has been a new-found level of determination. As I approach the base of a hill on a race course that I have put in all of the hard work necessary to rise to the occasion. I have prepared myself physically from my training. I have developed strong form that will hold up while I am fatigued. I am strong enough to race the hill and recover after reaching the top so I can climb again. The only thing left is to simply “Do It”. You have to want it, as hills are hard work. You have to trust in your training and let it all hang out. You have to be brave enough to take a chance that the hill might very well bite back. But if you’ve put in the training time and have worked hard to be ready, why not go for it? Why hold back? It is a matter of believing in yourself and pushing yourself close to the edge, not thinking that you can make it, but knowing that you will. When it comes to racing hills, that can make all the difference in the world.